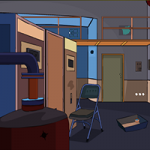 GFG Plump Room Escape is another point & click escape game developed by GenieFunGames. In this game, you have been locked in a plump room. Your aim is now to find the key and quickly escape. That's it! You can find useful stuff and clues for interesting puzzles to solve and finally get out of the plump room. Good luck and have fun! Hi all. Slider not working. Can't move the the middle blue and red tiles. Using Chrome under Linux. Hence, just one star. Sorry and thanks for your efforts. GFG. Hi kris - the sliders move to one junction at a time. They can stop on junctions that don't have a colour underneath. All of the tiles can be moved. A very satisfying and straightforward game from GFG. Hi tilts, very good answer!